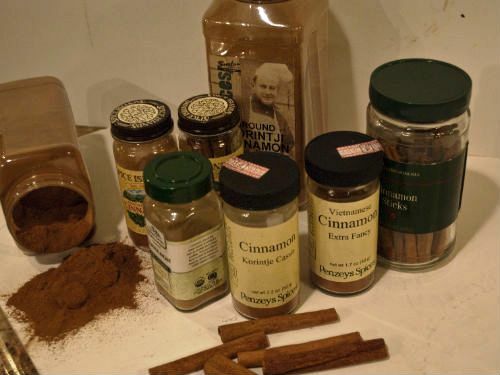 I was surprised to realize that there are many different cinnamons to choose from all with subtle taste differences? Some soft and aromatic, some almost chile like, able to deliver a powerful punch in your mouth. I looked through my overflowing spice drawers and following is a list of some of what I found. Penzeys, extra fancy Vietnamese Cassia cinnamon with 6% hig natural oil. This is the best available and extremely pungent. Penzeys, Korintje Cassia from Indonesian, 3% hig oil, strong true flavor. Spice Hunter, 100% organic, no country of origin given on label. Spice Island, Grand Saigon Cinnamon, smells like ‘red hots’ candy, recommended on the label for Middle Eastern dishes as well as baked goods. Surfa’s Chef’s Paradise, Korint Ji Cinnamon, very strong traditional cinnamon smell, probably Indonesian. Golchin, ground cheap generic with an overall true cinnamon smell and taste. So why am I thinking about cinnamon? 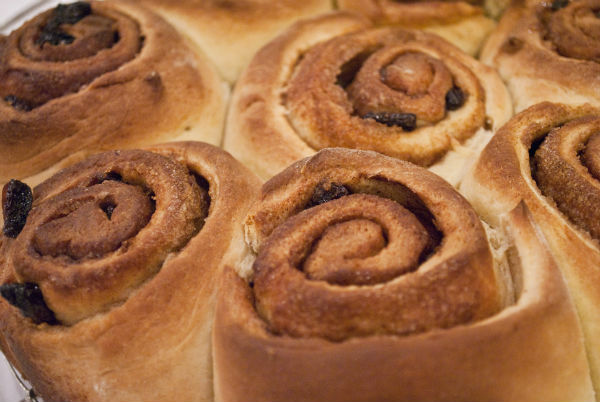 After I made the babkas the other day, cinnamon rolls soon entered my thoughts. 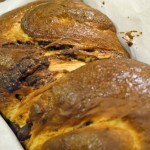 Wouldn’t the dough from the babkas, altered somewhat, make terrific cinnamon roll dough? 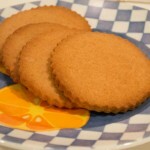 Place the warm milk and the 3 teaspoons of sugar and yeast in the bowl of a stand mixer. Let it stand for a few moments until the milk is foamy. Add ½ cup of the flour to the mixing bowl and turn on the mixer to medium speed. When the milk and flour are combined, add the eggs, vanilla, salt and 3/4 cup sugar. Beat to combine, and then reduce the speed to low, and add the flour 1 cup at a time. Turn up the mixer speed to medium. When the dough is smooth, begin to throw in butter 1 tablespoon at a time. The dough takes on a strandy look as the butter becomes incorporated. 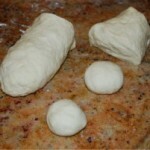 Set the dough aside to rise in a warm corner with a light plastic wrap on top. I make a nice little bed of dish towels to keep it warm. Let the dough rise for about an hour or until doubled. Divide the dough into two pieces. Each piece can be rolled out to an 11 X 16 inch rectangle. I recently purchased a huge silpat for rolling out pie dough and such. It is about 2.5 by 2.5 feet. Dough rolls out like a dream on it and the cleanup is much easier. Once you have a large even rectangle, spread it with 3 tablespoons of the soft butter. Spread the butter to within ½ inch of the edges. 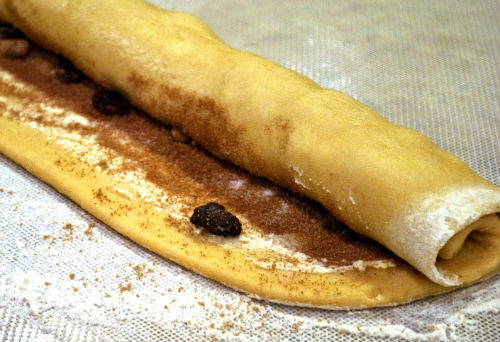 Sprinkle 1 and ½ teaspoons of cinnamon over the dough. 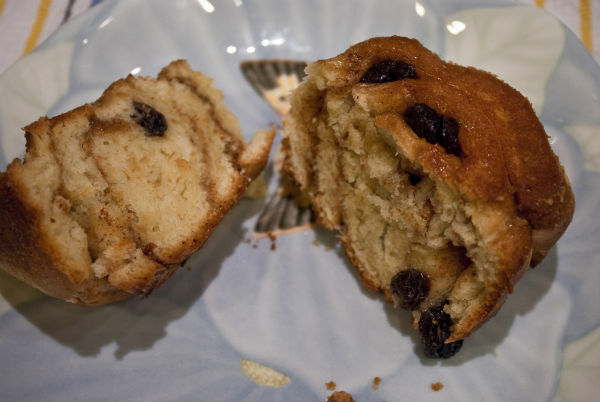 Next, scatter the brown sugar and finally the raisins over the surface. 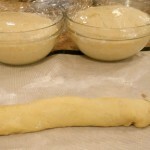 Beginning on one long end, roll up the dough into a tight cylinder. Pinch the seam shut. Using the palms of your hands pat the two ends of the cylinder to compact them and make that last piece more even. Slice each cylinder into 8-10 rolls. You can use a knife, but to avoid tearing the delicate dough, try a scissor or some dental floss that you slip underneath, cross and tighten. Place the rolls into two 9 inch cake rounds that are greased with butter. Place the cake pans with the rolls back in the warm corner to raise a second time. When they have doubled in size they are ready to bake. Bake in a 350° oven for about 20-30 minutes until dark golden. For classic icing, mix 3 cups powdered sugar with about 3 tablespoons of milk. 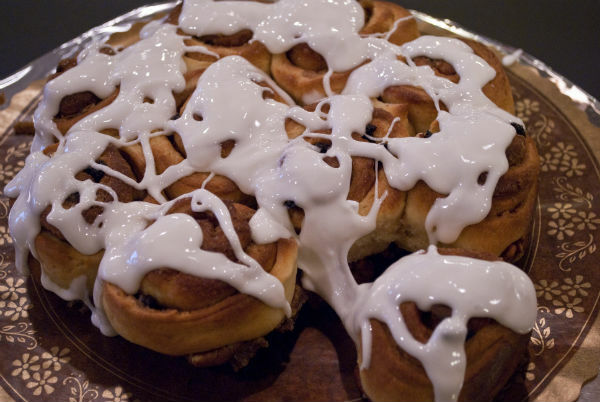 When the consistency is how you like it, you can spread or drizzle on cinnamon rolls. Variations, add a drop of vanilla or cream in some room temperature butter.